As Chase Resourcing send many candidates to Dubai we thought our candidates would find the results of the latest Dubai Population Survey interesting. Dubai Statistics Center (DSC) today revealed that Dubai’s resident population grew by 232,400 to reach 3,136,400 at the end of the third quarter of 2018, a growth of 7.7% from the third quarter of 2017. “DSC adopts international standards and methodologies to monitor Dubai’s rapidly changing population profile,” said Al Mehairi. “Data of both the resident and transient population of Dubai is crucial to identify infrastructural, social and economic needs. It is necessary to provide planners, decision-makers and investors an integrated and holistic picture of the demographic realities and movement of people within the emirate,” he added. DSC said that the net increase in the number of temporary residents in Dubai in the third quarter of 2018 was 6.6% compared to the same period in 2017. Meanwhile, the increase in the total resident population was 1.1%. The total active population in the third quarter of 2018 increased 7.7% from the same period in 2017. Al Mehairi attributed this growth to the fact that Dubai is an international commercial hub that attracts investors and talent from across the world in a wide diversity of sectors. The exceptionally high population growth rate is counter to trends in any other part of the world where growth is usually driven by natural population increase (births and deaths). Growth in Dubai’s Emirati population, in contrast, is driven by natural factors. The latest Dubai Population Survey from DSC also shows that males constitute 49.5% of the Emirati population while females account for 50.5% (89 males to 100 females). In the total resident population of Dubai, males account for 2,195,480 while females account for 940,920. 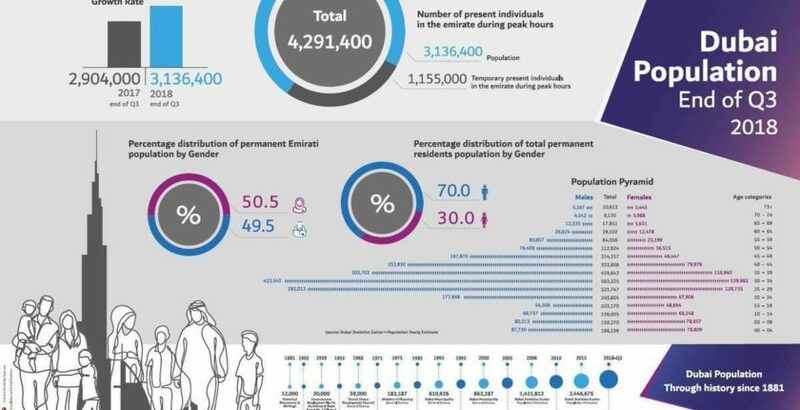 The vastly higher proportion of males in Dubai’s population (233 males to 100 females) is attributed to the fact that a majority of expatriate workers are males who live in Dubai without their families. The latest Dubai Population Survey shows that the 20-44 age group accounts for 66.45% of the population. Of this, the 30-34 age group accounts for the largest share with 563,525 individuals representing 17.97% of the total, followed by the 25-29 age group with 521,747 individuals representing 16.63% of the total. The 35-39 age group comes third with 419,642 individuals accounting for 13.38% of the population of the 20-44 age group. In the 19th century, specifically in 1881, the Dubai population was estimated at 12,000. This number has grown 261 times in 137 years to cross 3 million in 2018.